After departing from Inari, we (Agrafena Sopochin, Marija Launonen and me) headed up North to meet the writer Kirste Paltto at her place north of Karigasniemi at the River Tano. But first we took a stop at the Suttesaja spring and had a little hike. At recommendation of my colleague Philipp Burgess, I read an article about the struggle of local Sámi to protect the spring from being turned into a large scale water bottling factory Kirste Paltto took part in. The next day we were invited to the Sámi parliament in Karasjok and Anders Henriksen, the responsible person for the international relations gave us a wonderful tour through the building and discussed with us the particularities of the Sámi political representation in Norway. The financial resources that make such impressive system work are partly deriving from revenues made by the extractive industries, particularly the Norwegian oil-business. But in comparison the home region of Agrafena Sopochina, the Khanty-Mansi district produces almost 3 times more oil than Norway, but part of oil revenues that drop down to the indigenous people seem incomparable smaller. But is not only about money, but also about the weight of attention that is given to indigenous issues. A vivid example was the shelf of school-books in different Sámi languages, that was presented to us in the Sámi library in the same building. The tour through the Sámi Radio and TV-Station was just overwhelming for all of us. Nils Johan Guap from the NRK Sápmi told us everything and brought us even to the studio, where children’s programs are originally produced in Sámi language for Sámi children for a speaker community smaller than 30 000 people. It seemed like a fairy tale from the future for the Khanty guests against the background of reality in Russia nowadays. Then we went further North. The northernmost point of our journey we reached in Alta, where we had a look at the impressive rock-paintings. The drawings picked in stone show, that since the very beginning, when people came to the region after the ice age the reindeer was the most important animal for them. And it does so for the indigenous people in the Arctic up to the present day. So it was only logical, that after a beautiful journey through the landscape of the fjords, we visited Johan Mathis Turi, the former president of the Worlds reindeer herders association and a great specialist in reindeer herding culture all over the Arctic. He generously hosted us in his home on the Lyngs-fjord in Oteren. We had a beautiful evening with him discussing all kinds of issues of reindeer herding: new technologies like migrating the reindeer in big trucks as well as traditional knowledge like feeding differently prepared fish to the reindeer among the Khanty. From the Norwegian Fjord we turned back to the inland and to Finland were we decided to call Leena and Oula Valkeapää if they would be willing to meet spontaneously for an evening. We were happy that they agreed and we met them at their home at the beautiful Kivijärvi. In retrospective Agrafena considered this place the most beautiful, we visited on the whole journey. Leena and Oula shared with us the fish, they just planned to have for dinner. It was almost like an artistic composition – the place, the light of the sunset, the food and the conversations on indigenous views, on Johan Turi and Nils-Aslak Valkeapää, Oulas uncle. But the journey was not over after this highlight. Now we travelled south, met Prof. Veli-Pekka Tynkkynen in Tampere and Mart Meri in Tallinn, before reaching finally Saint Petersburg by car. Both meetings I would almost call historical. Veli-Pekka discovered that decades ago as a young student he hosted Agrafena not knowing that his interest in Russia and the areas, where the Khanty are living, would make him later one of the leading experts in Russia’s energy policy. Now he is one of the supervisors of Marija’s master thesis at the University of Helsinki. With Mart Meri Agrafena shares the memory of one of the most important moments in the cultural live of Surgut Khanty in the last century. They were both collaborating with Lennart Meri on his documentation and film project “Sons of Torum” recording a unique number of Khanty bear feast performances. I’m full of hope, that this meeting after almost 30 years will be the beginning of a new enterprise – the return of Khanty heritage for the revival of the Surgut Khanty bear ritual. In this blog entry, I want to tell the story of a wonderful journey I made recently with my friend and colleague Agrafena Semjonovna Sopochina and her daughter Marija Launonen through northern Finland and Norway, to Tallinn and to St. Petersburg during the second part of August 2016. Agrafena Sopochina visited Finland already in 1999 as member of a delegation of Khanty and Nenets taking part in the conference “Indigenous people and oil” (her presentation). She took part as well at the 2nd World Reindeer Herders’ Congress in Anar (Inari), in 2001. She is nowadays one of the most influential Khanty activists and author of most schoolbooks in the Surgut Khanty language. For decades, she was running the Surgut Khanty folklore archive and collaborated with almost all researchers starting from Lennart Meri during his shootings of the “Sons of Torum” in 1985 and 1988. Agrafena is collaborating with me now on the unique recordings of the Surgut Khanty bear feast from 1985 and 1988 by Lennart Meri and myself in spring 2016. She is also assisting Sergei Kechimov (Сергей Васильевич Кечимов) the Khanty elder who is sued by Surgutneftegaz for defending the sacred lake of Imlor. There is plenty information about him and his case in the internet. It was a long time plan I had to invite my friend Agrafena to Lapland to show her the beauty of that Arctic region. This way I wanted also to provide the possibility for her to meet local Sámi activists as well as reindeer herders. This kind of return visits become more and more an integrative part of anthropological research we are doing here in Anthropological Research Team at Arctic Centre. Taking the rules of reciprocity of our research partners seriously means to invite them to our private homes as well after they opened the doors not only to the public façade of their cultures but also to the everyday life of their families. Therefore, I had to host Agrafena and Marija at my home in Rovaniemi, take a tent and a car and wrote to a lot of Sámi institutions up north, that two Khanty and an anthropologist are ready to camp in their backyard or out on the fells, if they would be ready to meet us. Immediately I received a call from Marina Falevitch from the Sámi Education Institute in Inari. She not only invited us to the wonderful dormitory at the shore of the Lake Inari, but also organised a three days full program for the Khanty guests. The generous hospitality of the Sámi Educational Institute was impressive and Marina spend all her working time and even her free time in order to let us feel like honourable guests in the Sámi community of Inari. Marina’s husband drove us to different Sámi enterprises in the vicinity and served self-caught and smoked fish from the Lake Inari. This was not the last time we encountered the great Sámi hospitality on our way north. But back to the fulltime program in Inari. Thanks to Marina Falevitch we got a deep inside in all the educational activities among the Sámi in Inari. Agrafena mentioned that the Surgut Khanty could only dream about the achievements, that the Inari dialect has made in the last couple of years. The Surgut dialect of Khanty language is in a quite similar position being dominated by another not understandable dialect of a close group in the North – the Northern Khanty language. As the Inari Sámi, they would love to involve lay people and elders in the education of children and would like to have other school subjects than just the “mother tongue” taught in their own language. Impressive and unique is also the position of the Sámi Education Institute for the development of traditional knowledge and crafts of the Sámi. There is nothing comparable in Western Siberia. The slaughterhouse we visited in Toivoniemi made the differences even more palpable. 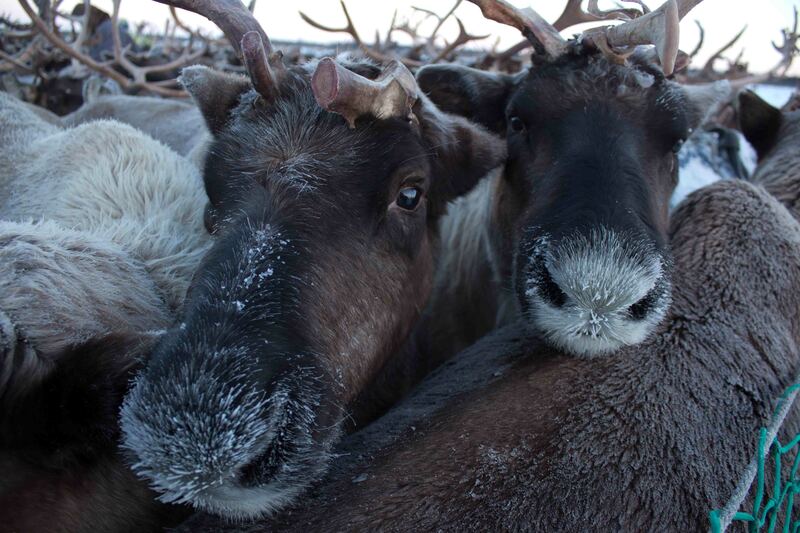 Reindeer herding among the Khanty is far from being a meat producing business with strong regulations of slaughtering guaranteeing stable meat quality. Economic pressure rises the number of animals a herder should have in order to survive. Effectiveness of meat production demands big numbers – a logic that is (yet?) foreign to the Khanty. At the evening the leadership of the Sámi Educational Centre invited us to a wonderful dinner at restaurant Aanaar at the Kultahovi. Everybody was impressed, what the chefs were able to produce from local ingredients like reindeer lichen. But more important were the discussions about similar issues Sámi as well as Khanty are facing today. Liisa Holmberg told about the international cooperation on the protection of sacred sites. In Sápmi sacred sites are either long time known places partially turned already into tourism destinations, as the sacred island Ukkonsaari, we visited the next day. Or they are intimate places of worship known only to the family. Agrafena told about the vivid religious community rituals among the Khanty, but also about the religious, legal and political struggle ongoing between Khanty custodians of the sacred sites, oil-companies, protestant converts and state administrations. The degree of conflict but also of public religious activities among the Khanty differs a lot from the Sámi experiences, but the underlining logics are similar. We departed with the hope, that the future international cooperation on the issue will include also the Khanty cases of struggle for such important sacred places like Imlor, Numto or Shaman-Gora in the Surgut region. Probably the main purpose and highlight of the visit to Inari was a short but intensive visit of the material in the Sámi archive collected at the beginning of the 1990ies among the Surgut Khanty. These materials, like the ones that were recorded by Lennart Meri and preserved in Estonia, will hopefully return to the Khanty one day. But it is important that the efforts to make them available respect the ethics of knowledge distribution as well as access rules of the indigenous people they were collected from. We got the strong impression during our meeting with Inker-Anni Linkola and Ugnė Starkutė that here at the Sámi archive these principles are held in high esteem and it is one of the rare examples, where high quality archival work is combined with indigenous perspectives on knowledge transmission and information management. 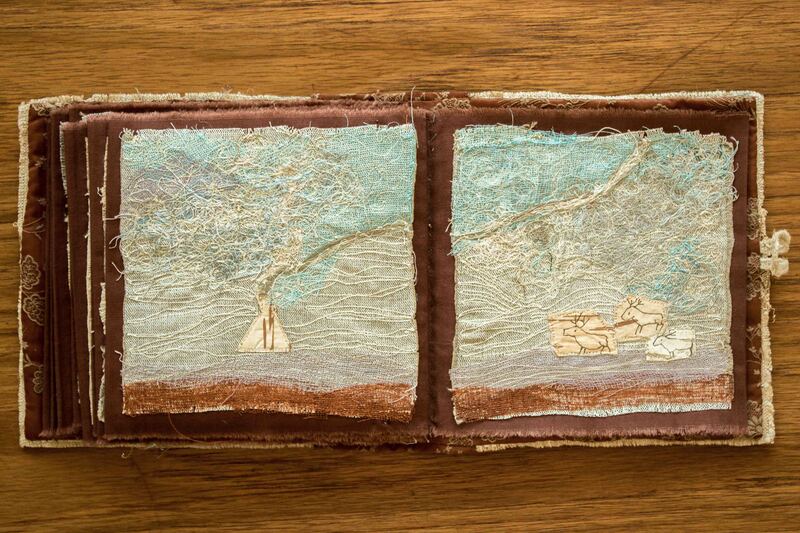 and to the studio of Kaja Paltto producing art, made of felt. The third place was Ahkun Tupa, where we discussed the traditional Sámi dresses and their development. In comparison to the generations before, the dresses became much more colourful and ornamented, but they stopped being an everyday clothing. Whoever we met among the Sámi was amazed of the laboriously Khanty ornaments cut and sewn by hand without any technical tools. In the evening, we experienced again a presentation of local culinary skills – this time by graduates of the Sámi Education Institute in the Lassen-Kota of the college. The day before we met already Sámi singer Nilas Holmberg at the hotel Kultahovi and he suggested us not to miss the concerts of the Sámi music festival “Ijahis idja”. The highlight was of course Sofia Jannok, Sámi singer from Sweden. Waving the Sámi flag and wearing an army jacket underlined her performance as a straightforward statement for active and militant struggle for indigenous rights. She cited even the movie “Avatar” as a model for her perception of indigenous history. Next day we met the president of the Sámi parliament Tiina Juulia Sanila-Aikio or Skolt Sami: Paavvâl Taannâl Tiina. Maybe the title president implies to follow a protocol and a formalised way of meeting. This was not at all the case. At the opposite – the Sámi president is just a highly skilled professional on the issues the parliament is dealing with today. Agrafena and her daughter discussed very openly with her the functioning of the Sámi parliament, the topic of traditional music and rights to cultural traditions, for instance information on rituals and sacred places. They spoke about the question, if indigenous people should have property rights on their knowledge or should be the caretaker or custodians of that knowledge when the problem arise that the legal system has difficulties to acknowledge this kind of custodianship and care. The Khanty consider it more as a duty which oblige people to deal carefully with knowledge and use it in a proper way said Agrafena. There are other than human beings involved: animals, gods, spirits and the ancestors and private property rights of living humans might not be the best solution to deal with sacred places, traditional symbols and designs, with music or other performative arts from Agrafena’s perspective. When Tiina Sanila-Aikio brought us to the exhibition room Agrafena was overwhelmed of the variety in the collection of schoolbooks in Sámi languages. In the evening Agrafena and her daughter presented Khanty music on the stage of the festival. Here some links to the”Ijahis idja” homepage in Finnish; Yle about Khanty guest in Finnish language and about the visit in Sámi language; about their performance in Sámi and Article in Sámi language about the festival. After the performance Pekka Samalahti grand senieur of Sámi studies approached Agrafena, whom he remembered from her former visits to Finland. Agrafena met a kindred soul in the man who devoted all of his life to the study of a minority language just as she did as well. After their performance Marija and Agrafena gave a radio interview to Yle Areena in Skolt Sámi language. I have visited the Western Siberian Khanty in the vicinity of the oil towns in the Surgut region for twenty years now. Never could I have imagined I would see a performance of the famous Khanty Bear Ceremony documented thirty years ago by the Estonian intellectual and film director Lennar Meri in his film ”The Sons of Torum”. I was certain that the practice of organising a several days long ritual after a successful bear hunt had become extinct among the Khanty at the Tromyogan, Pim, and Agan Rivers north of the middle Ob River in Western Siberia. A generation after Lennart Meri had filmed the Surgut Khanty, I thought the time was due to revisit the remaining participants of “The Sons of Torum”. I wanted to learn how they remembered the bear festival and why it had ceased being performed. 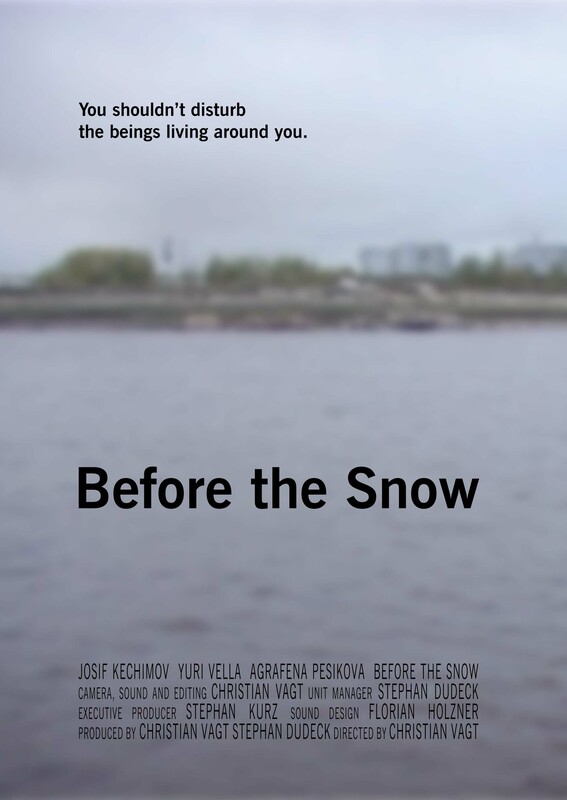 I set out with multimedia artist Antti Tenetz to the Tromyogan River in November 2015 to visit Iosif, the son of the main protagonist of the film, the shaman Ivan Stepanovich Sopochin. We showed him Meri’s film and promised to repatriate copies of the recordings made in 1988. At the end of our journey, we received the surprising invitation to attend a new attempt to perform the ceremony. Up to the very last moment when I arrived in March 2016 with Antti at the Tromyogan River, we were not sure if we would really have the possibility to participate in the ceremony and whether we would be allowed to make the recordings we had intended. We learned upon arrival that the official initiator of the event, the Khanty folklorist Timofei Moldanov of the Torum-Maa Museum was counting on our recording devices in order to document the whole ritual. Three linguists, Lyudmila Kayukova, Agrafena Sopochina and Zsófia Schön suggested to collaborate on the documentation of the ritual and we met two long-time friends, Olga Kornienko, a film maker from Surgut, and Aleksei Rud’, a PhD student from Ekaterinburg. The main local performer and organiser of the ritual, Sergei Vasilievich Kechimov, was also very keen on documenting the whole ritual and allowed us to film virtually everything. The ritual started with a reindeer sacrifice near the Tromyogan River in the presence of the remains of the hunted bear. A ritual entrance into the house of ceremony and a divination ritual followed. The symbolic five days of the feast, containing theatrical performances, dances and songs were fit into three days from the morning of 21st March to the morning of 24th March 2016. We learned about the clear distinction between shamanic rituals and the bear feast, which explicitly excludes every shamanic practice. It’s another strict taboo to argue and take offence during the days of the feast filled with laughter at even the most coarse jokes. Curious TV journalists showed up and left us with mixed feelings as they showed no interest in the meaning of the ritual and its ethics among the Khanty. They all left bored by the long repetitive songs on the second day. The first days consisted of eleven hours of performances while the last day and night the performers didn’t stop singing, acting and dancing for 23 hours. I recognised with pleasure all generations and quite a number of young Khanty were present. The future will show what direction the research of the performance will take. It will have to start from the interest of the Khanty to repatriate the collected and archived materials and to revitalise the bear ceremonial. A priority will be to make the recordings available to potential singers. I am still amazed by what I have witnessed and have already discovered a lot of details not yet mentioned in the existing literature on the Surgut Khanty bear feast. In contrast to the well researched bear feast of the northern Khanty and the Mansi, descriptions of the ceremony among the Khanty along the middle Ob remain rare. At the beginning of the 20th century, two researchers were able to visit a Surgut Khanty bear festival, Kustaa Fredrik Karjalainen on 10th January 1901 near Surgut, and Raisa Pavlovna Mitusova on 3rd September 1924 in the settlement Yaur-yaun-pugol by the Agan River. The main research questions have yet to be determined but some general directions have already become clear. The research will have to reach beyond the common discourse of victimisation and endangerment to explore the complexity of cultural revitalisation in the form of killing and reincarnation. My starting point is the insight that the ritual as well as ethnographic film deal with the relationship of difference and affinity and with death and return. The bear ritual encounters the bear as a significant other. It stresses the difference and affinity of the bear to the human community and transforms the dead bear into a cultural hero and implements a long lasting relationship between the hunter and the prey as well as the human with the non-human spiritual being. To be part of this process and to start to understand such a unique cultural performance is what makes anthropology one of the most exciting professions in the world. In August 1985 and 1988, Lennart Meri recorded the bear festival at the settlement Vat’-Yaun-Pugol at the invitation of the Khanty writer Yeremei Aipin, who left a short description of the ritual in one of his novels. The musicologists Jarkko Niemi and Katalin Lázár and the Hungarian linguist Márta Csepregi recorded some bear songs with the Surgut Khanty in the 1990s which have remained unpublished until today. Parts of bear songs collected by Jarkko Niemi were published in 2001 on the CD ”The Great Awakening”. Olga Balalaeva and Andrew Wiget have recorded bear feast performances at the neighbouring Yugan River. Some days ago, I received a book. 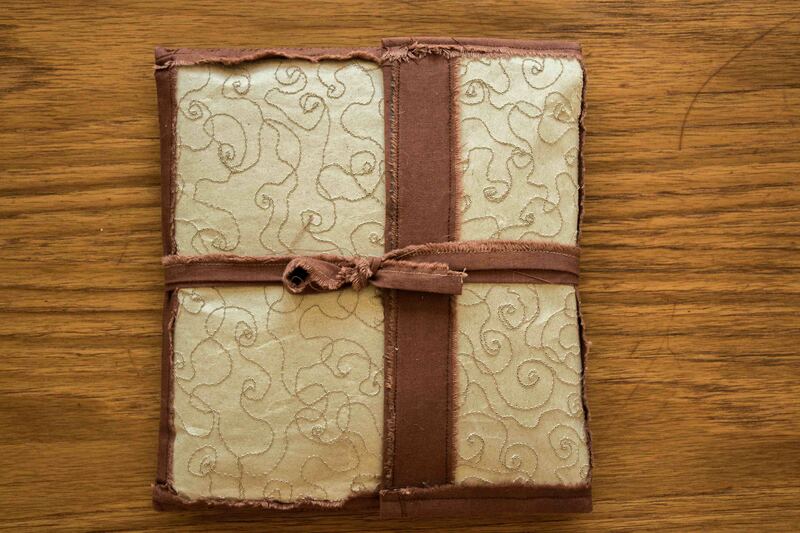 My friend Eva Toulouze gave it to me in Paris to take it with me in autumn, when I will travel to Siberia. I’ll have to give it to the family of the late Yuri Vella in order to be placed in the museum, that will soon open in his home village of Varyogan in Western Siberia. 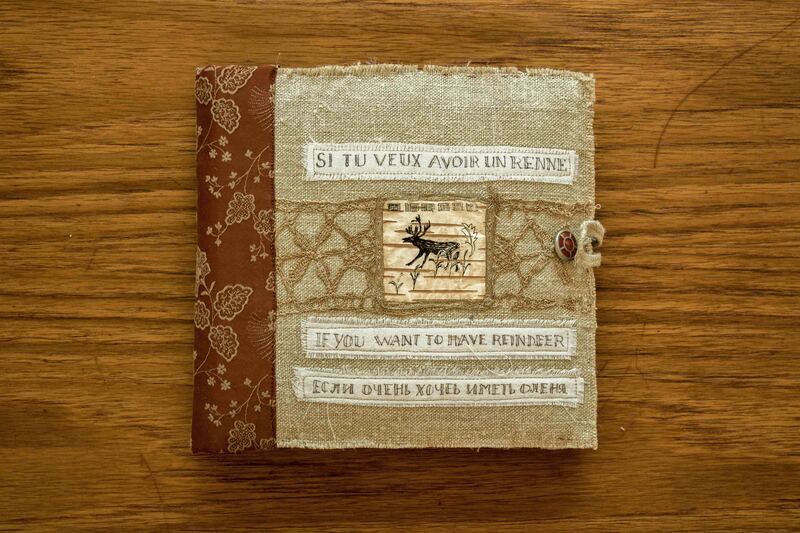 The book is such an astonishing piece of art that I decided to take photos and ask Anne Bouin, the artist who made the book if I can share it in my blog. It is not the first time I have hold this unique book in my hands. I have seen it more than a year ago in Tartu at the conference organised to honour our deceased friend, the Nenets Poet and reindeer herder Yuri Vella. I have to admit that nowadays I am reading mostly on the screen of my computer or smartphone. When I saw the book, I had an ambivalent feeling. It reminds me of something quite old. 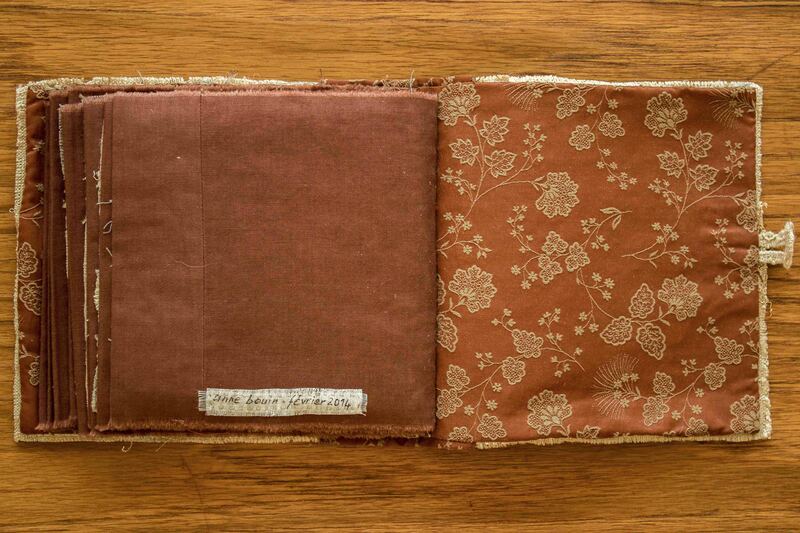 I had associations of a precious old manuscript from a library or a museum. On the other hand, I thought that this is how books will look like in the future. Something you can only appreciate, when you hold it in your hands, something you cannot copy even with a 3D-printer. 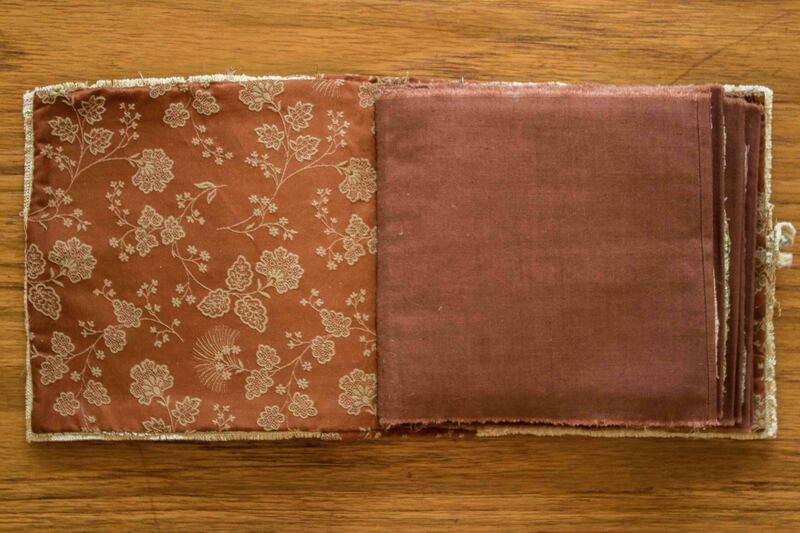 All other books will disappear or only be printed at occasion, when you need to read something on paper. But books in order to keep them, to put them in a bookshelf, to get them from time to time in order to show them to guests, to experience the materiality of the cover and to touch the surface of the pages, such books will survive, will be produced and bought and inherited to the next generations. From this perspective, this book is an ultramodern book. 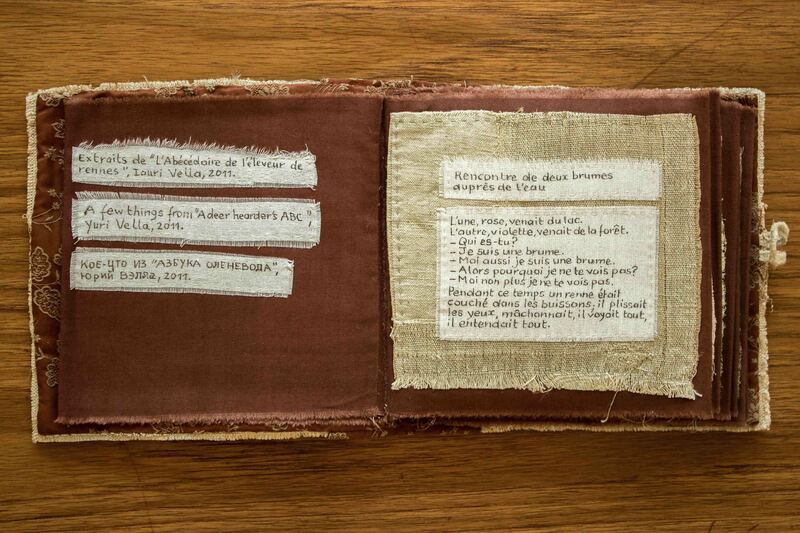 Anne Bouin sewed the book by hand. It took me some time to realise that every time I look at a page I discover something new. Some places look as if they start to fade away, some look like a palimpsest. 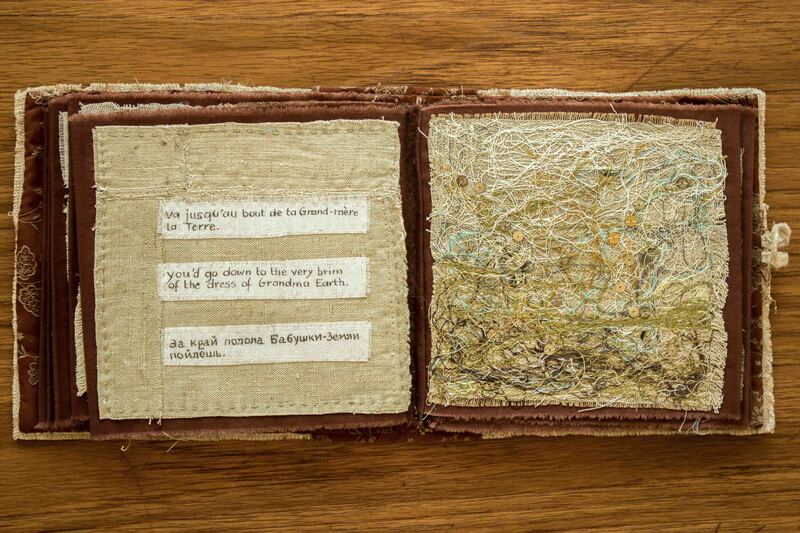 They unite the feeling of Arctic landscapes with the associations of centuries’ old books and textile art from the south. They are like a labyrinth but seem to offer Ariadne’s thread as well. At the first glance, it looks like a children’s book with pleasant colours and cute picture, but then you discover the subtle and refined way the artist puts the texts and the pictures into a dialogue. – I am the mist. – And I am the mist, too. – Then, why don’t I see you? And all the meanwhile a young deer lay close by in the thicket, chewing the grass, his eyes closed, and he saw and heard everything. It is an unusual book as the title tells already. ‘If you want to have a reindeer’ … Who could be that ‘you’? The text contains fragments of Yuri Vella’s ‘ABC of the reindeer herder’ with recommendations for his fellow reindeer herders. I know from experience that they rarely take a book in their hands. The few, who carry on with reindeer herding in the midst of oil fields in Western Siberia do not need written books in order to understand the business inherited from their fathers. 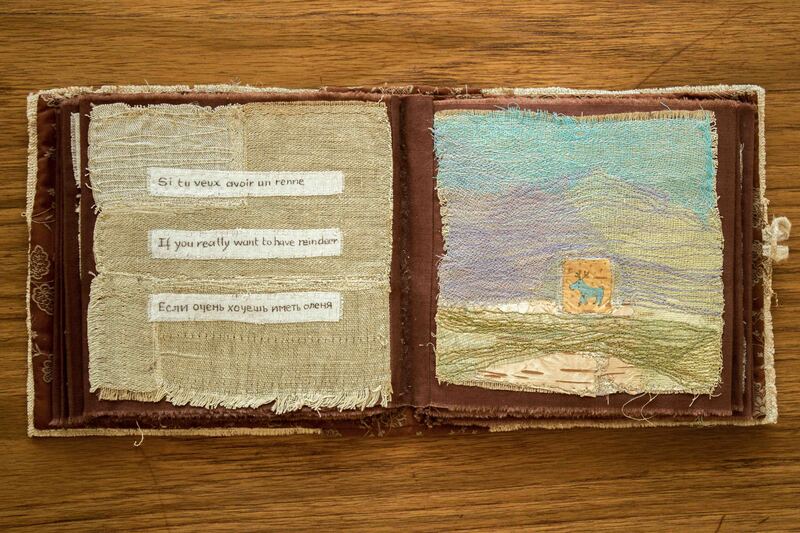 The small scene described in the middle of the book gives a hint – an innocent bystander, the reindeer, witnesses the dialogue between the two mists who talk to each other but cannot see each other. The book is a text in several aspects. 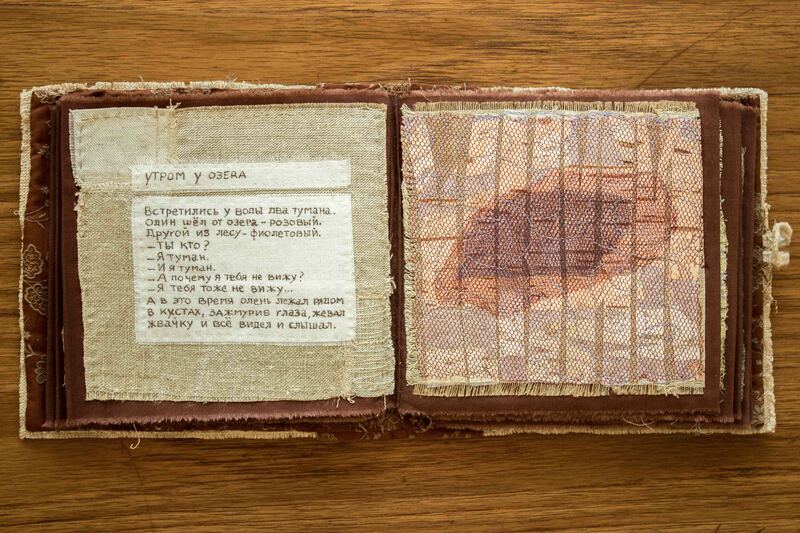 There is the handwritten trilingual text of Yuri Vella in English, French and Russian. Russian might not been the original language as the author’s mother tongue was Nenets, but he was fluent also in his wife’s language Khanty. He was trilingual in thinking and communicating but lost the fight against the powerful ideology of monolingualism. His children and grandchildren are fluent only in Russian. Only in his books and writing Yuri insisted to have as much translations into different languages as possible, often in the same book. He was not aiming at the prestige to be a writer translated into all big languages of Europe, but believed that every language adds its own perspective, its own nuances to the text. Intuitively Anne Buin felt probably that she was very close to the concept of writing of the Siberian cultures. 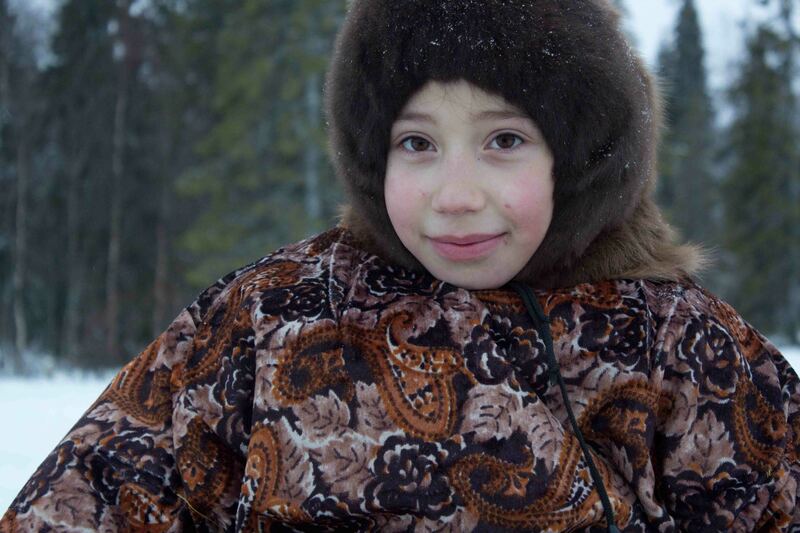 The Khanty language knows only one word for ornament, embroidery and writing. It is a women’s task to ornament the clothes with complicated meandering applications, to cut geometrical ornaments into the vessels made of birch bark. All of them have symbolic meaning and are something like extensions of the human body of the user or the owner. Their main task is to protect the human body from evil influences. The bad spirit or the evil eye get lost or trapped in the complicated, meandering and multi-layered ornaments as the good spirits get attracted by their beauty that reveals the mastery of the author to the outside world. 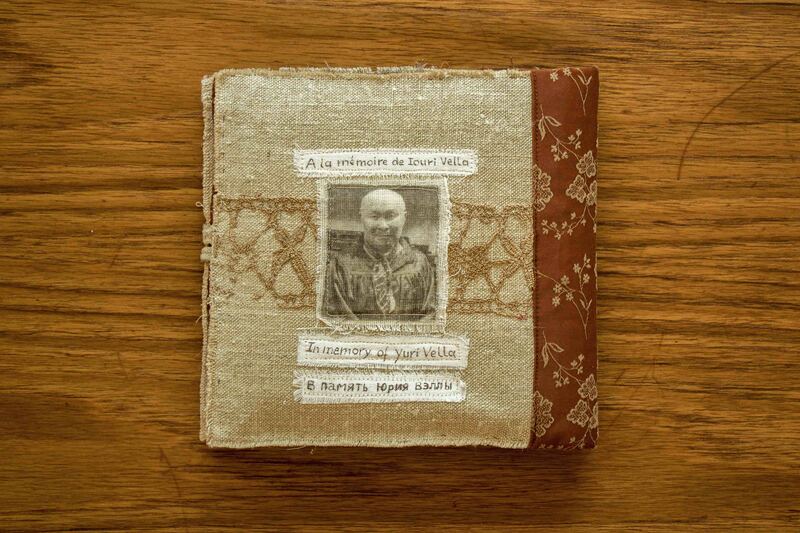 To attract the good spirits and to fight the evil with the threads of words is also the aim of the poems of Yuri Vella. 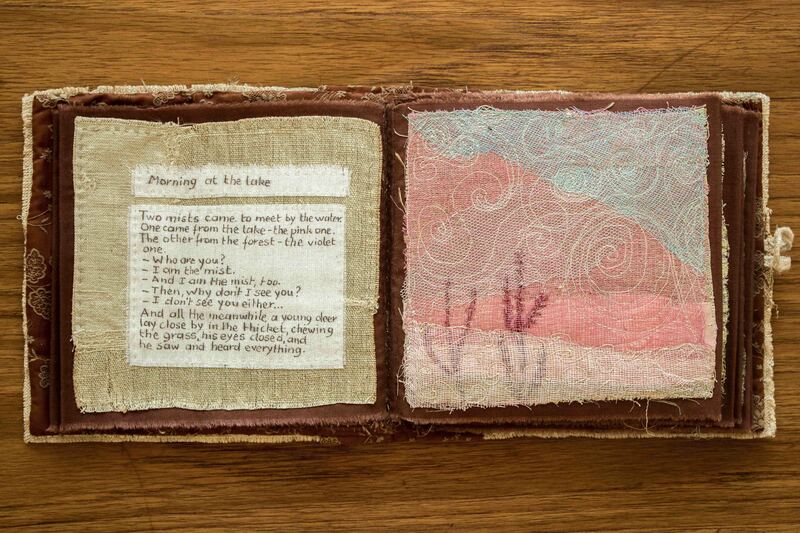 The book presents a dialogue of the maze of threads of words and seams building interlaced streams of meaning which opens up to the one who opens the book every time anew. 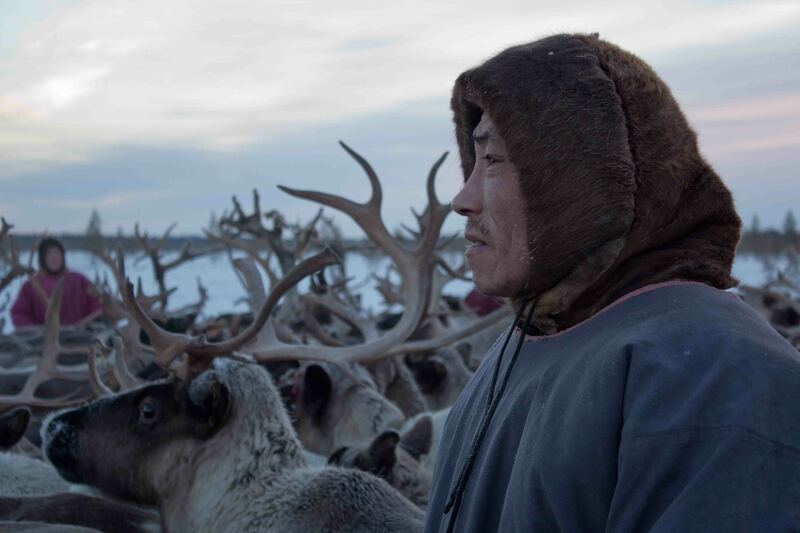 For the first time in my life I celebrated the arrival of the new year with the reindeer herders. I managed after a lot of difficulties to arrive at the camp site North of the Russian town of Mezen’ on the 30th December. 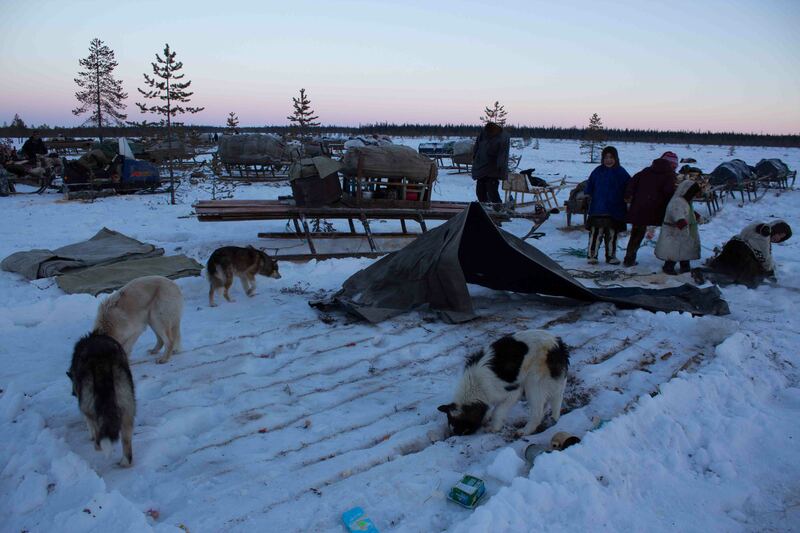 There is not much celebration during that time of the year, when the herders move to a new camp site almost every day before they reach the winter pasture in the Arkhangelsk region. We are now just below the Arctic Circle and the sun is not yet appearing above the horizon. Fortunately the temperature dropped on New Year’s night from plus zero to something under minus 10°C. At night it will become minus 27°C. From afar we could see some lights of the fireworks in Mezen’. On the 31st December we crossed the sacred place of Kozmin perelesok. I am sharing my reindeer sledge with Natasha. She and her mother offered a beautiful porcelain cup in that forest and I put some coins with the many offerings that almost everybody leaves there while crossing. 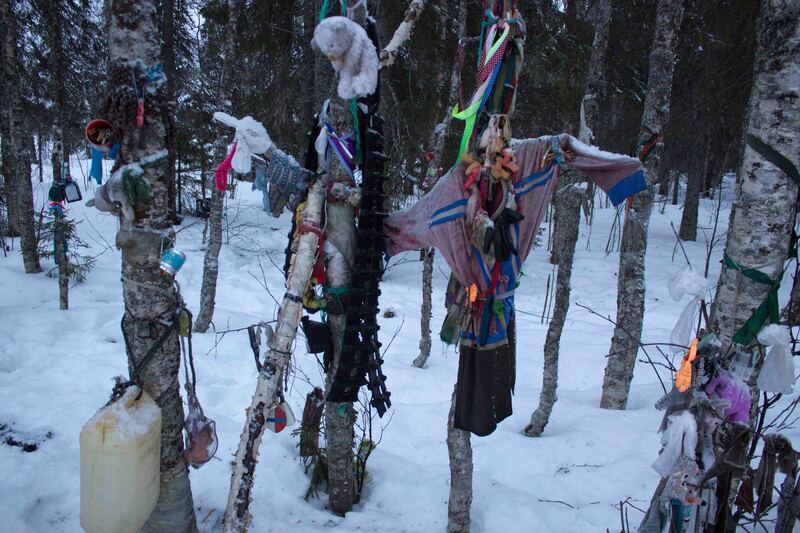 Unfortunately some people do not understand the Nenets tradition of offerings and just leave some unnecessary things in the belief that it helps to avoid misfortune. In the morning we pack all of our stuff in the reindeer sledges, take the canvas from the roof and remove the four walls of the tent. The draft reindeer for the sledges are chosen from the herd of trained bulls. When everything is ready the caravan goes to the next camp-site. Today I was lucky to catch the mobile phone net next to Mezen’. Next time I will have internet connection I hope I can let you know more about my recent fieldwork for the ORHELIA project with the reindeer herders of the Kanin peninsula. 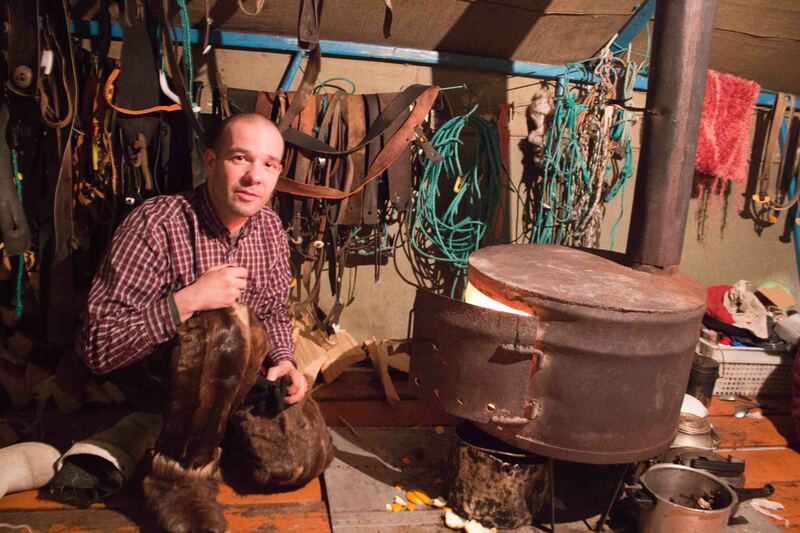 Together with photographer and film-maker Christian Vagt I visited Khanty and Nenets friends in Siberia in 2007. Now the result is online as a short film. 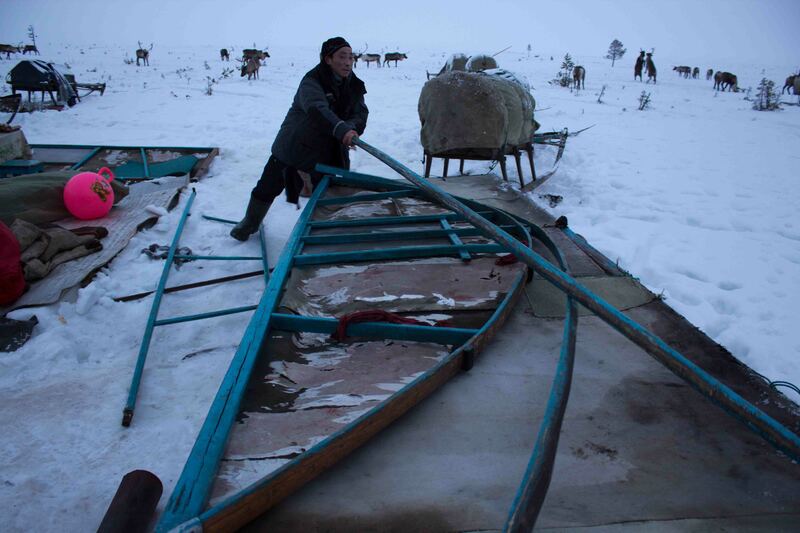 For the indigenous Khanty and Nenets in the block houses and nomad tents near the Western Siberian oil fields, stories of the dead, of spirits and ghosts are a living tradition. They’re a way of encountering fear, evil, and harm. Individual experience and folklore mix in the accounts of reindeer breeders Josif Kechimov and Yuri Vella and linguist Agrafena Pesikova. The film mounts in her analysis reflecting the contrast of indigenous and Western culture and the resistance against the intrusion into the belief of the natives.